For the fruit salad: In a medium bowl, stir together all ingredients. Cover and refrigerate up to 8 hours. For the syrup: In a small saucepan over low heat, warm syrup and cinnamon, stirring frequently to blend. Keep warm over low heat while preparing waffles. For the waffles: Preheat oven to 275°F. Sift flour, baking powder, baking soda and salt into a large bowl. In a medium bowl, whisk buttermilk, eggs, butter and syrup to combine; a few bits of melted butter may be firm. Make a well in center of flour mixture, pour in buttermilk mixture, and use a large spoon to combine. There may be a few small lumps. Stir in crumbled bacon. Spray a waffle iron with cooking oil spray or brush lightly with oil. Preheat according to manufacturer’s directions. Pour batter (a generous 3⁄4 cup for each pair of waffles) evenly onto hot waffle iron. Cook about 3 minutes, until waffles are browned and, when waffle iron top is lifted, waffles release easily. Any steam coming from waffle iron will subside when waffles are done. Repeat to make 8 waffles. Uncovered waffles can be kept warm on a baking sheet in oven while remaining waffles cook. Arrange waffles on 4 plates. 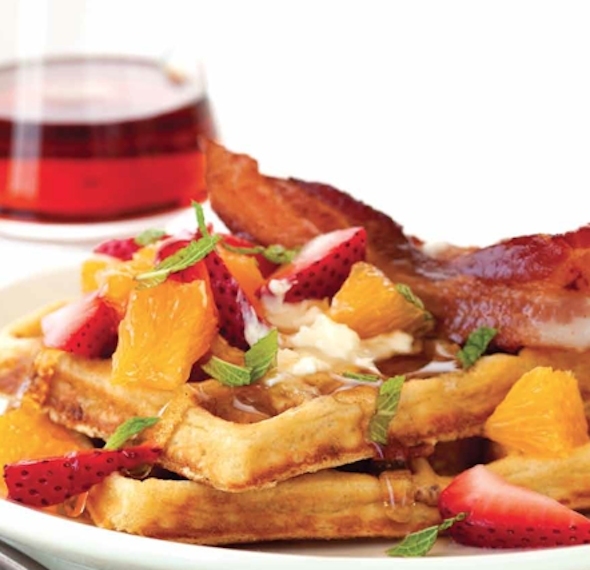 Divide fruit salad among plates, add several mint leaves, and arrange 2 strips bacon over each serving. Serve with warm syrup. 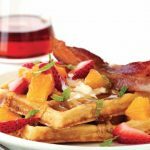 Mix it Up • Substitute 1/2 cup chopped pecans, chopped walnuts or toasted almonds for the crumbled bacon. • Add 1⁄2 teaspoon cinnamon to the waffle batter for an unexpected flavor. 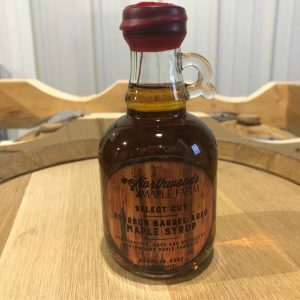 • Tired of maple syrup? Try vanilla or cinnamon whipped cream.